Dr. Bentley was born and raised in Pikeville, Kentucky. 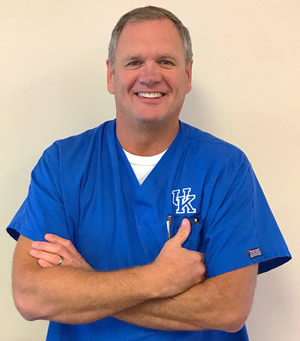 Dr. Bentley attended undergraduate school at Pikeville College and then graduated from the University of Louisville College of Dentistry in 1991. Dr. Bentley and his wife have two children. After graduating from dental school, they moved back to Pikeville where he went into practice with Dr. Marvin T. Bush. Dr. Bentley is a member of the American Dental Association, Kentucky Dental Association, and the Kentucky Mountain Dental Association. He completes several continuing education class throughout the year. He is a member of the Roman Catholic Church. In his spare time he enjoys sports, hunting, and spending time with his grandson. © Copyright 2001- Dental WebSmith, Inc. and Marvin T. Bush, DMD. All rights reserved worldwide. Disclaimer: The information provided within is intended to help you better understand dental conditions and procedures. It is not meant to serve as delivery of medical or dental care. If you have specific questions or concerns, contact your health care provider.